This kit includes enough wool yarn to knit the 1861 Cottage-Industry Mittens and Wristers seen in the Jan/Feb 2013 historical knitting issue of PieceWork magazine. Knit Mary Lycan's 1861 Cottage-Industry Mittens and Wristers, as seen in the January/February 2013 issue of PieceWork magazine. 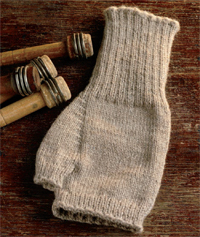 The pattern for these mittens was interpreted from the short story "Knitting Sale-Socks" first published in The Atlantic Monthly in February 1861, in which these mittens are the most common style of mittens made from either homespun yarn or store-distributed yarn and sold to villages to supply farmers, lumbermen, and fishermen. This knitting kit includes the patterns for both the 1861 Cottage-Industry Mittens as well as a modern wrister pattern, if you prefer your fingers free. This kit also includes enough yarn to make either two pairs of mittens, two pairs of wristers, or one of each in Natural White and Sand colors. 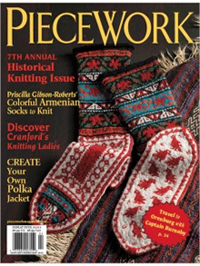 The seventh annual historical knitting issue, this digital edition of PieceWork magazine includes a look at Armenian knitted socks, the history of Polka Jackets, the earliest known knitting pattern, Orenburg knitting, and much more. 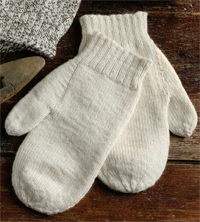 PieceWork January/February 2013 features Mary Lycan's patterns for the 1861 Cottage-Industry Mittens and Wristers. For the wearer, the stretchy cast-on and short-tight ribbed cuff of these mittens are easy to pull on and off. After the thumb gore stitches are dropped, the stitches cast on to close up the thumb are decreased to form a small gore or fourchette, providing a good fit for handling tools of many trades. If the palms of these mittens get wet, simply switch the mittens so the wet part lies on the back of the hand. Prefer your fingers free? Mary Lycan also provides a pattern for wristers, a modern version of the 1861 Cottage-Industry Mittens that allows extra mobility with the fingers and features a longer cuff. 2 skeins of Cascade 220 yarn! Cascade 220 yarn is an industry standard in today's knitting world. This 100% Peruvian Highland Wool is a favorite among knitters for its stitch definition, stability, and warmth. This kit includes one 220 yard skein of Cascade 220 in #8010 Natural White and one 220 yard skein of Cascade 220 in #9499 Sand. This kit includes enough yarn to knit one pair of Natural White mittens and one pair of Sand wristers, as seen in PieceWork's January/February 2013 magazine. We have a limited supply of knitting kits, order your 1861 Cottage-Industry Knitted Mittens and Wristers kit today while supplies last.